Dehydrated pears can be enjoyed plain as a simple snack, as sweet highlight ingredients in oatmeal or breads, and also make an interesting addition to savory dishes, pairing beautifully with hard Parmesan, blue, or Romano cheeses. Quarter the pears and remove the cores. After the core is removed, cut the pieces into thinner slices. Optionally, pre-treat the pear slices in ascorbic acid dip, fruit juice dip, sulfite dip, or blanch in syrup. Syrup blanching will change the consistency of the dried fruit, resulting in a sweeter, candied texture. Place the pear slices in the dehydrator trays a single layer thick. Dehydrate at 140° F for 5-7 hours in a dedicated food dehydrator. Using a typical home convection oven can take 12-20 hours. The dehydrated pears will be finished with they have a leathery to crunchy texture. 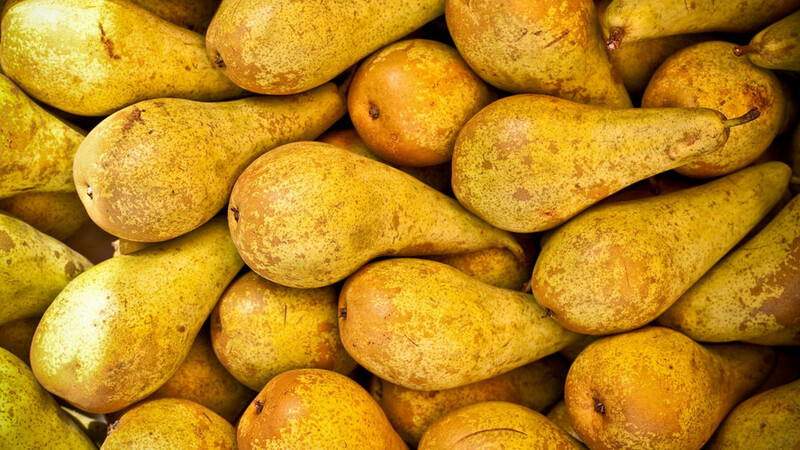 For the best results, store in vacuum sealed bags, or sealed freezer bags in the refrigerator or freezer until you are ready to eat the pears.